I love being able to have the meditations here readily available at all times. My one complaint about the app is that if you move it to the background and then come back to it, it goes through the whole startup process again which is a small inconvenience but still a little annoying. It's more convenient in a machine shop than a printed book, glad this is available. This app is amazing and a go to for me every morning. 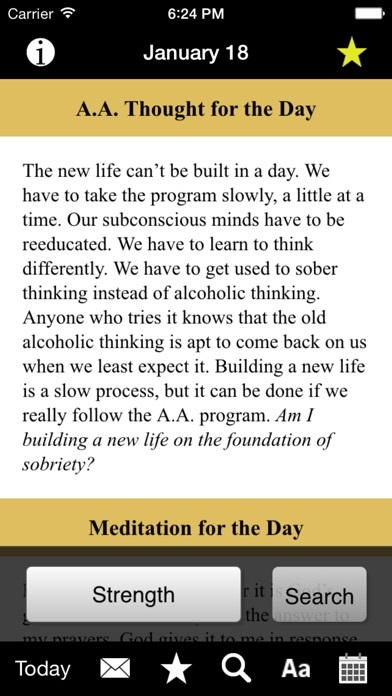 Let's face it, if your working your sobriety or just want some great insight, this app is a must have. The interface is easy to you and it even has a calendar where you can read past or future readings. It's worth every penny and I never leave home without it! I read this first thing in the morning. What a great way to start your day. Love being able to carry this around with me and use throughout the day! Please please please add in the ability to organize your favorites into folders! Otherwise, amazing smooth app! I was given this book in treatment 28 years ago, and because it still works, I still use it. It is so applicable in life. Now I have the ap and can read it anytime anywhere. A good spiritual tool for daily living that has been laid at my feet. Great app for the undisciplined new new comer. This, along with daily bible readings, has helped me immensely over the years! God bless you!!! This is an integral part of my 11th step practice. It keeps me centered and balanced throughout the day. I love it! I read the 24 Hours a Day passages every morning. From each, I will take one word, one phrase or one sentence that inspires me and gives me Godly Direction and copy it into my calendar to reread at points during the day to continue to do His Will. 24 Hours a Day is essential to my every day. Besides my Bible, this is my go to book for inspiration, comfort or call to change my attitude. Have been reading for years. Love having it on my phone! Essential reading for balance, love and connection. Just an invaluable resource. The Favorites option lets you compile the best of the best in ways the actual book does not allow. Much gratitude for this app. I like being able to carry it around. I look forward to reading it everyday. I can read from 24 any time. I refer to it during meetings & in conversation when I don't have my book with me. Excellent portability and use it with my Big Book app. I love having my Daily at my finger tips 1st thing every morning!! This has become a major part of my morning. I highly recommend it! Rich's little black book in my iphone- Brilliant! Excellent tool for a day to day meditation!!!! I use it every morning to start the day heading into the right direction. I'm pretty new and don't always remember to seek my Higher Power first thing in the morning. These readings help remind and focus me to start my days off right. This is my away from home or on the go morning meditation and get focused app. I'm in a 12 step program so it helps a lot. So it was worth the $$$ I spent for some peace of mind. Perfect start to my day. 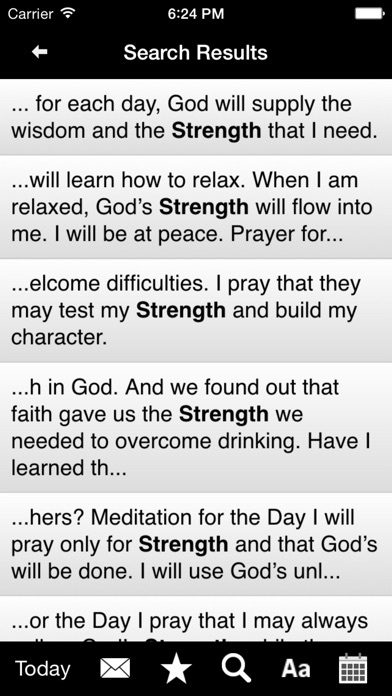 I read this along with another app that includes the 3rd Step prayer, the Lord's Prayer, and the Prayer of St. Francis. Should Have Purchased Long Ago! I normally don't write reviews, but this app is especially noteworthy. I have used the hard cover version faithfully since my first sponsor gave it to me over twenty nine years ago. I now travel a lot on a motorcycle and having the app saves me space and time. Not to mention it's functionality, (and my old reliable is showing the signs of continuous use!). It works flawlessly. One of the very best apps I have ever used. I love having access to this 24 hours a day. I use this as part of my daily tools for recovery. I have been extremely blessed to have this in a digital easy format. The little black book is a favorite of mine and this app makes it so accessible. Thank you for making this happen. God bless. 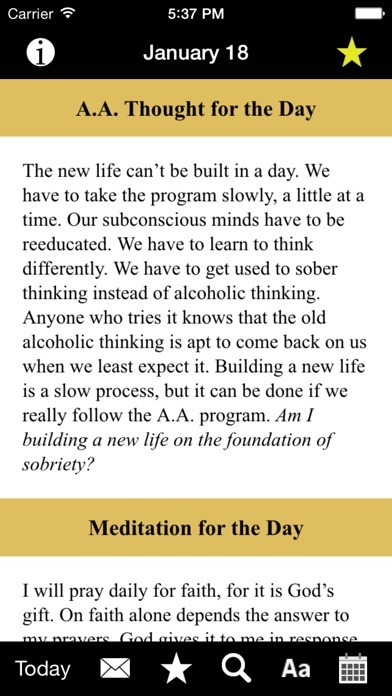 What a blessing to have this pop up every morning and get my head on straight before another wonderful day of sobriety Douglas T.
Reading these thoughts and suggestions on a daily basis is a big part of my program! I love this daily devotional. Great wisdom. What's not to love? It's easy to use and I can mark favorite days. The reading for the day pops up at the appointed time and I am easily able to start my day with with the most important item - an attitude of gratitude. Read it daily, keeps me going. This was recommended to me by my sponsor as a tool to use in my beginning stages of sobriety. I've read it everyday and it really has helped. Great reminders for your day to day living. Whether it is related directly to you or not. The readings always will touch base with you. I'm glad I have this. I have only been using the app for a week or so, but I am enjoying it immensely. It is the first part of my morning reading, prayer and meditation, and it sets the tone for the rest of my day. I highly recommend it to anyone who is trying stay sober. Love getting my daily dose of motivation from this app. So steadfast and comforting whenever you pick it up. These words endure. 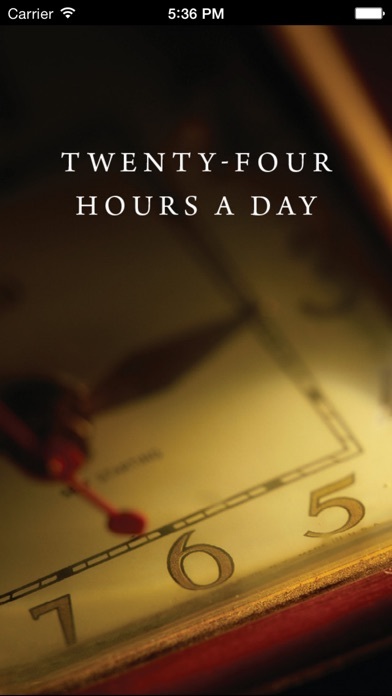 I have the 24 Hours A Day book but I sure like being able to read the daily message on my Smart Phone any time I want a lift. Great recovery tool. There are times when I don't have access to my 24 Hours A Day book, but I'm seldom without my phone. Great way to start the day with a meaningful thought. Love this app! I use it everyday to lift my spirit, encourage myself and keep my eye on the prize. 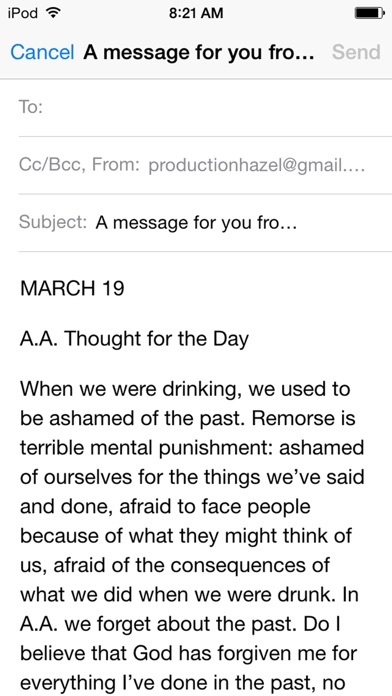 Love the ability to send daily message to friends and fellows in recovery. Many times recipients message back "thank you! I needed that today!!" I start each and every day with a prayer asking god for guidance and then my daily reflection. I really enjoy this it's especially great on trips. Love this book! Read it every morning! I love having this app on my phone... it makes it so easy to read the daily meditation even before I get out of bed in the morning. It helps start my day off right. It truly helps my focus get where it should be "centered on Him" when I awake...the book is great too, however it does go off with an alert in the same place as my morning alarm does, my phone!!! My trusted companion.. thankful to have it. I love using this app! It is the perfect devotional to start off my day.